A few thoughts after returning from my latest stop: Yosemite National Park. I carefully chose each park this year. Not based on which national parks are the most beautiful. Or which ones I’d most like to visit. I picked each one because I thought it could symbolize a different issue for the future. With Yosemite, that issue was people, lots of people, and the age-old question: Are we loving our parks to death? 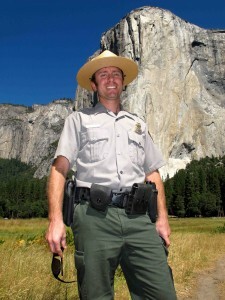 When I met with NPS director Jon Jarvis last fall, he said he hates that phrase. In essence, he said that his concern for the future isn’t about having too many people visiting parks. It’s about having too few. I agree. Making sure Americans care about the national parks. That’s the biggest issue for the future of the parks. And that’s something I’ll get back to later — and undoubtedly keep coming back to throughout the project. But there certainly are places where the volume of visitors creates issues. That’s part of the reason I started the year in Acadia. It was relatively quiet atop Cadillac Mountain as the sun rose on Jan. 1 (well, except for the sound of the whistling wind). But by summer, managing people — not just from cars, but from cruise ships and tour buses — becomes a huge issue. And it’s like that at quite a few places in the parks, perhaps none moreso than Yosemite. 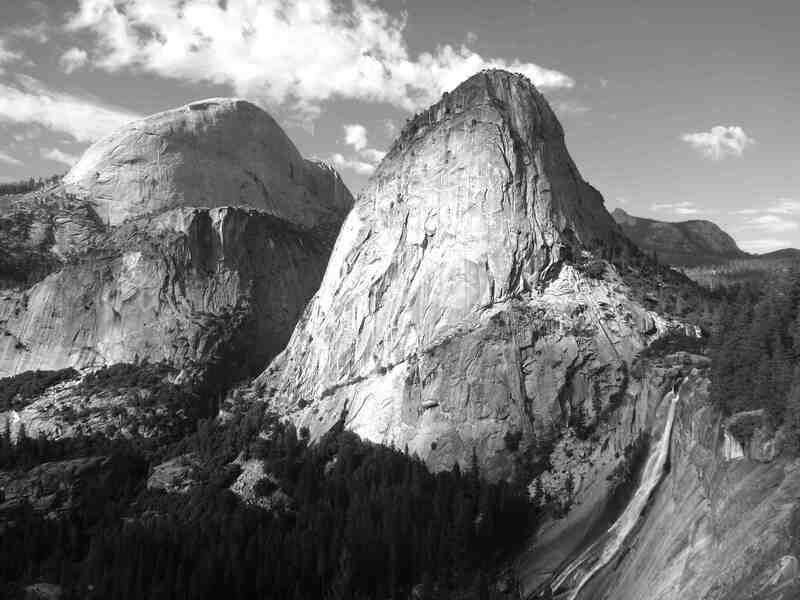 In 1916, Yosemite had 33,390 visitors. It hit 1 million in 1954, 2 million in 1967, 3 million in 1987 and 4 million in 1996. 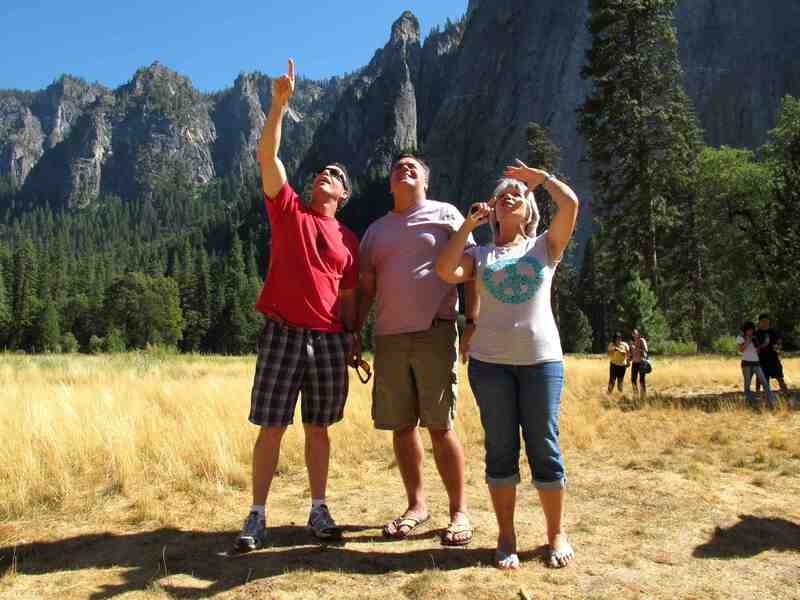 And it isn’t just that Yosemite gets this many visitors a year. It’s that many of them end up crammed into a relatively small part of the park, the valley, largely in the summer months. So I purposefully chose to go to Yosemite, and to camp in the valley, in August. 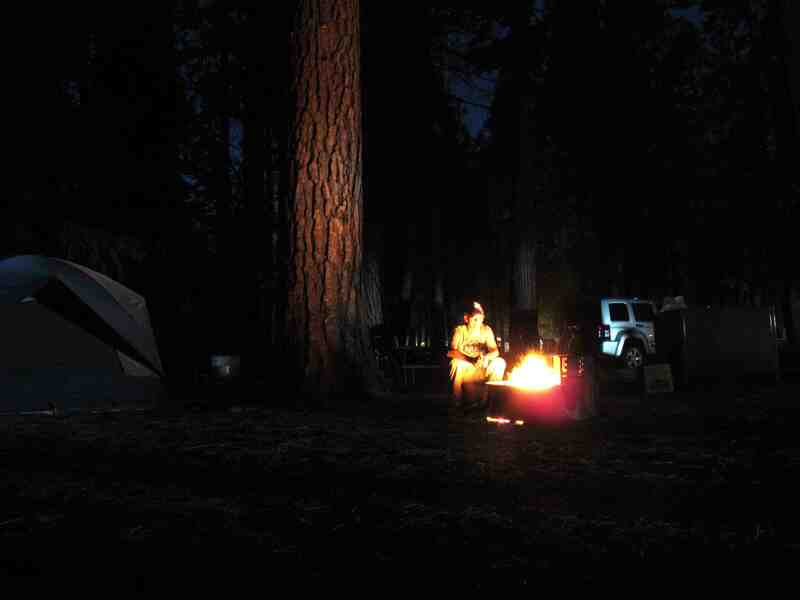 When I made those plans back in the spring — reserving a campsite in the valley in summer is its own adventure — little did I know I’d end up in the middle of one the biggest news stories to come out of the national parks this year: hantavirus in Yosemite. When I left home, one person had died from the mouse-borne virus. While I was there, it was announced that another person had died, 91 tent cabins in Curry Village were shut down, the National Park Service ramped up its outreach, the CDC issued a health advisory and thousands of nervous visitors — those who had visited and those who were planning to visit — were calling a hantavirus hotline. Not that I was aware of most of this. I camped in the Upper Pines campground, in a site about a half a mile from Curry Village. With no television and limited cell signal and internet access, I was oblivious to most of the news. It wasn’t until I got home that I realized just how much world attention was focused on Yosemite valley. So when I get around to telling the story of my time in Yosemite, hantavirus will be a part of it. (A third camper died today, Sept. 6.) But it certainly doesn’t dominate my memories of my time there. — After going to Yellowstone, I wrote about the book, “Everybody Needs a Rock” — and how it doesn’t just apply to kids, how adults need rocks, too, and how we can find them in the national parks. I thought about that as I drove into Yosemite, entering from the west. And, yes, truth be told, this was a big reason why I chose to go to Yosemite. It was partly because of all the people and the issues that arise from such crowds. But it also was because of this beauty and these rocks. I wanted to return to the place I went when I was a kid, the place that inspired Adams and John Muir and millions of others. And even with hantavirus, I was hardly alone. The campground was full. The roads were busy. Yosemite was getting a lot of love. — Mornings at the foot of El Cap. Traffic and transportation and other such issues are important. I also find them kind of boring. So when I went to Yosemite, my plan was to focus on a different kind of congestion — one that few would have fathomed when the parks were born. Crowds on Yosemite’s granite walls. Most mornings I got up and rode a bike about 5 miles to El Capitan. Even at this time of year, in the morning, with the sun starting to rise, the valley is incredibly peaceful. And the first couple of days, the 3,000-foot walls looked pretty much the way they must have 100 years ago. Empty. During the summer, most of the climbers head to higher elevations. But as Labor Day weekend approached, and a bit of the heat started to fade, the climbers started to return. 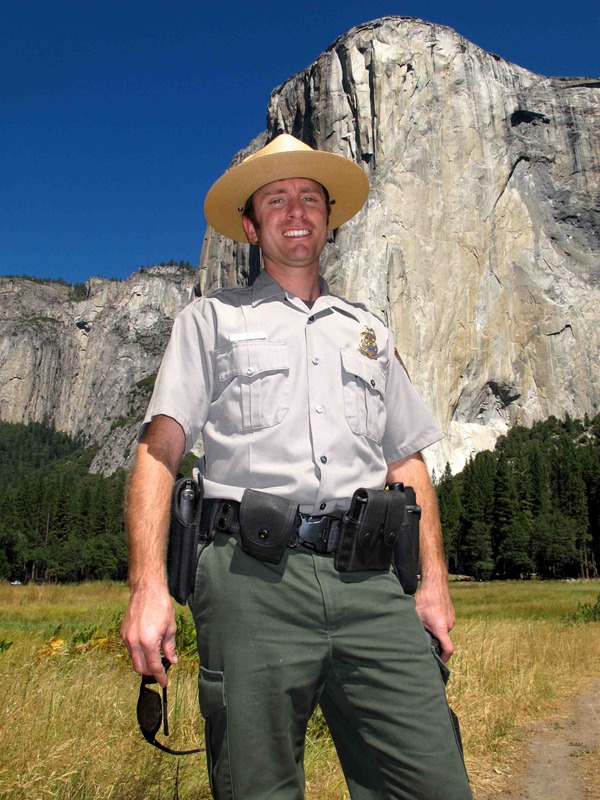 I spent one morning in the nearby meadow with Yosemite climbing ranger Jesse McGahey. As he pointed to El Cap, telling me about how climbing it has changed through the years, a small black bear wandered through the meadow. Jesse took out his binoculars, spotted its tag and noted the number. Throughout the conversation the radio on his belt crackled with updates about incidents in the park. And after we talked, we planned to head back to his office in separate cars. I had been having trouble making a call to get into the lottery for a permit to climb the cables on Half Dome. If my cell phone didn’t work, I was going to try his landline. 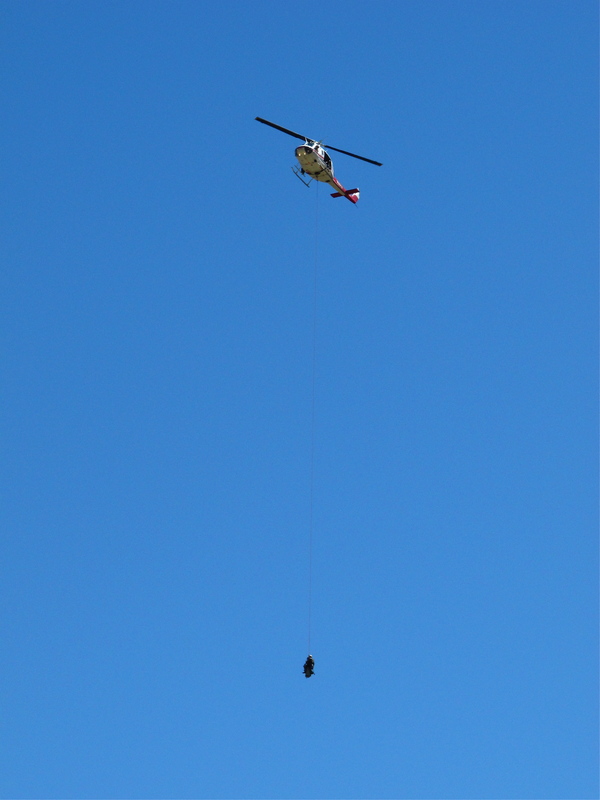 By the time I got there, he was gone — called out to be part of a search and rescue. I was having lunch when I heard the helicopters. They were coming off Half Dome, the second one with three people — two rescuers and one injured climber — dangling at the end of a long rope. Even before this, I was thinking about how dangerous Yosemite can be, how it isn’t just a matter of people loving the parks to death. This is a place where one of the popular books in the bookstore recounts all the deaths in Yosemite. And it is 600-plus pages and growing. An extreme-sports writer died this summer. Shortly before my trip, two boys drowned in the Merced River. And now this. A deadly rodent-borne virus. Maybe it’s a matter of losing my mom and contemplating a lot of things. Maybe it’s just a matter of paying attention to what is happening in the parks. But I’ve been thinking a lot about how the parks are full of life and full of death. And how in nature, the two are so closely intertwined. — It was fascinating to spend time with McGahey and climbers at the Climber Coffee, a gathering to discuss issues of the day (and the future). And I appreciate Ken Yager, a longtime Yosemite climber with a wealth of stories and expertise, finding time to meet with me and give me all kinds of great background. (I also recommend reading “Camp 4,” by Steve Roper, built around El Cap and the iconic campground beneath it.) Yager is trying to establish a climbing museum in the park. Which makes sense. Even those of us who don’t climb — who can’t even fathom being on these walls — are fascinating by it. By the end of the week, there not only were climbers on the walls, there were busloads of tourists in the meadow, craning their necks, pointing at the specks. One of those specks was Joseph Shultz, a 28-year-old from Colorado, making his first attempt at climbing El Cap. I met him while hiking near the foot of El Cap and asked if I could tag along as he hiked the approach to “Lurking Fear,” a route that he explained is one of the easiest on El Cap. This, of course, is all relative. The easiest route on El Cap is still mind-bogglingly hard for most of us to imagine. As much as I liked talking to the veteran El Cap climbers, I also liked getting the perspective of a first-timer. Shultz was doing the climb solo. He planned to take five days. Before leaving him, I got his contact info and said I planned to follow up. (He said I probably wouldn’t be able to reach him for a few weeks. I’ll let you know what I find out). As I hiked back down to my car, my quads were screaming not only from scrambling over these rocks, but from what I had done a couple of days earlier. Compared to climbing El Cap, my big accomplishment for the trip — hiking to the top of Half Dome — seem hardly worth mentioning. 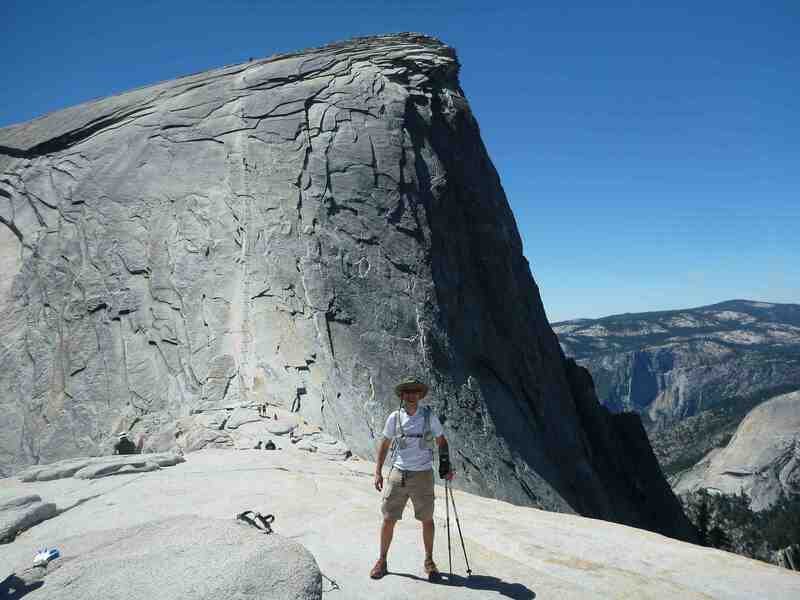 But I’m going to anyway, because this hike — and the cables atop Half Dome — also have become an issue for the future. — To limit congestion on the cables, the park service began a daily permit system last year, which added to an already heated debate. Some believe the cables, initially put up in 1919, should be torn down completely. Some believe there should be no permit system; that anyone who reaching that point on the hike should be able to climb the cables. Some believe the current system finds a good middle ground. I’m still trying to figure out what I think about this. For that matter, I’m still trying to unclench my hands after gripping the cables like my life depended on it. Which is only being slightly melodramatic. I did get a permit in the lottery. So I got up at 5:30 a.m. one morning — they say to allow 10-12 hours to hike 8.2 miles up to Half Dome and 8.2 miles back down — crawled out of my tent, turned on my headlamp and began a hike that was overwhelmingly beautiful and, at the top, intimidating. I had read that the cables stretch 400 feet, at a 45-degree angle, up the side of Half Dome. Those numbers don’t do it justice. Going back to my high school math, 45 degrees would mean the grade is halfway between flat and vertical. And that may indeed be true. But it sure felt much more vertical than flat — which made each and every one of those 400 feet seem a lot longer. For the real climbers that flock to Yosemite, going up this is about as daring as playing on a jungle gym. For those of us with mixed emotions about heights … well, I think my palms are still sweating. And, yet, this experience will be one of my favorite memories of Yosemite. On my last day there, I grabbed my bike and rode to the Mirror Lake trailhead. During the day, this is a busy trail. But at this point, it was nearly empty. I hiked a short distance, looked up and realized that Half Dome was looming overhead, directly in front of me, not at the angle seen in most photos. — A special thanks to my neighbors in the Upper Pines campground. I was one of the few solo campers I saw. And Helmut and Flo Kuhnen of Canada decided to take pity on me and invite me to dinner one night. It was the best meal I had all week. This made me miss my family. It also made me think about the lasting power of these trips. Before they left, they asked if I wanted five beers. They didn’t want them to go to waste. So I took them off their hands and we chatted for a while. We talked about how many foreign visitors were at Yosemite. And how sometimes you take for granted what you have in your own country. I told them that their two children — about the age I was when I first visited Yosemite — will remember this place for a very long time. — And, finally, many of my favorite memories of the trip come from spending time with Shelton Johnson. If you saw “America’s Best Idea,” the PBS series, you’ll remember Ranger Shelton. When I went to Yellowstone and saw the famous north entrance, one of the first things I thought about was Johnson’s beautiful, poetic, funny description of stepping off a bus there. Last fall when I met with Dayton Duncan, the writer behind the series, and asked him who he thinks are the modern-day John Muirs, he thought about it for a moment and said, “Shelton Johnson.” As an African-American who grew up in inner-city Detroit, he might seem like an unlikely modern-day John Muir. But considering the changing face of America — and the fear that too narrow a niche of America loves the parks — he might be the perfect one. And when he speaks, you almost feel as if he is channelling the man perhaps best known for his love for this place. 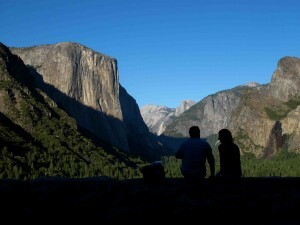 I’ll save the details of what else we talked about and skip to one of my saddest moments during my week in Yosemite. 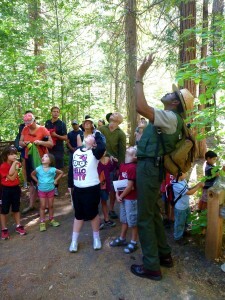 Ranger Shelton was leading a junior ranger walk. It was about trees. And at one point, he had the children look at some leaves on a tree and tell him what color they were. “All of them?” he said. One of the children pointed at another leaf. “This one is pink,” she said. That, Ranger Shelton said, is one of the first signs of fall in Yosemite valley. I know that nobody is going to feel sorry for me “only” having a year to spend in the national parks. I know this is a dream come true. Not just for me, but for many others. I’ve heard that over and over. But now that the leaves are starting to change, now that we’re into September, a year feels way too short. Next stop: one of our newest national parks, the Flight 93 National Memorial. Thank you so much for sharing your year in the National Parks and the other events in your life this past year, Mark. Your storytelling skills always leave me wanting a little bit more - never wanting the story to end. After your piece on finding rocks, I immediately went and got the book for my grandaughter. We all need those rocks and I have to admit, there are a few around my home that have been carried there from a number of locations. Enjoy the last few months on your adventure. Yosemite is one of those things on my bucket list. I stumbled upon your site while searching around about Yosemite and have enjoyed reading about your visits to various National Parks and the thoughts they aroused. Also sorry to read about your mother's death; she sounds quite inspirational. And I never heard of Gateway; quite right to include it! If you are on FaceBook, I have lots of hiking photos; I am so lucky to live in the Pacific NW! Thanks. I picked out a WordPress template that I thought would work, then had some co-workers at the paper help me set up the site. They said it would be easy. But even with their help, I took me several days to get it up and running. Of course, that all was a few years ago, which in internet years is a lifetime. I'm sure things have changed. I guess I'd just suggest trying to pick out something simple, at least for starters.